"Faba" redirects here. For other uses, see faba (disambiguation). This article is about the broad bean plant. For the Broadbean company, see Broadbean (company). 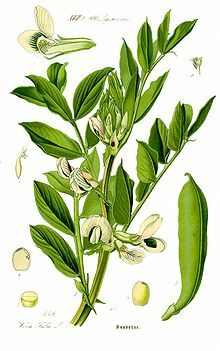 Vicia faba, also known in the culinary sense as the broad bean, fava bean, or faba bean is a species of flowering plant in the pea and bean family Fabaceae. It is of uncertain origin:160 and widely cultivated as a crop for human consumption. It is also used as a cover crop, the bell bean, which has smaller beans. Varieties with smaller, harder seeds that are fed to horses or other animals are called field bean, tic bean or tick bean. Horse bean, Vicia faba var. equina Pers., is a variety recognized as an accepted name. Some people suffer from favism, a hemolytic response to the consumption of broad beans, a condition linked to G6PDD. Otherwise the beans, with the outer seed coat removed, can be eaten raw or cooked. In young plants, the outer seed coat can be eaten, and in very young plants, the seed pod can be eaten. Vicia faba is a stiffly erect plant 0.5 to 1.8 metres (1.6 to 5.9 ft) tall, with stems that are square in cross-section. The leaves are 10 to 25 centimetres (3.9 to 9.8 in) long, pinnate with 2–7 leaflets, and colored a distinct glaucous (Latin: glaucus) grey-green color. Unlike most other vetches, the leaves do not have tendrils for climbing over other vegetation. The flowers are 1 to 2.5 centimetres (0.39 to 0.98 in) long with five petals; the standard petals are white, the wing petals are white with a black spot (true black, not deep purple or blue as is the case in many "black" colorings) and the keel petals are white. Crimson-flowered broad beans also exist, which were recently saved from extinction. The flowers have a strong sweet scent which is attractive to bees and other pollinators. The fruit is a broad, leathery pod that is green, but matures to a dark blackish-brown, with a densely downy surface; the wild species has pods that are 5 to 10 centimetres (2.0 to 3.9 in) long and 1 cm diameter, but many modern cultivars developed for food use have pods 15 to 25 centimetres (5.9 to 9.8 in) long and 2–3 cm thick. 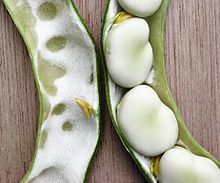 Each bean pod contains 3–8 seeds that are round to oval and have a 5–10 mm diameter in the wild plant, but are usually flattened and up to 20–25 mm long, 15 mm broad and 5–10 mm thick in food cultivars. V. faba has a diploid (2n) chromosome number of 12 (six homologous pairs). Five pairs are acrocentric chromosomes and one pair is metacentric. Broad beans have a long tradition of cultivation in Old World agriculture, being among the most ancient plants in cultivation and also among the easiest to grow. Along with lentils, peas, and chickpeas, they are believed to have become part of the eastern Mediterranean diet around 6000 BCE or earlier. They are still often grown as a cover crop to prevent erosion because they can overwinter and, as a legume, they fix nitrogen in the soil. The broad bean has high plant hardiness; it can withstand harsh and cold climates. Unlike most legumes, the broad bean can be grown in soils with high salinity, as well as in clay soil. However, it prefers rich loams. In much of the English-speaking world, the name "broad bean" is used for the large-seeded cultivars grown for human food, while "horse bean" and "field bean" refer to cultivars with smaller, harder seeds that are more like the wild species and used for animal feed, though their stronger flavour is preferred in some human food recipes, such as falafel. 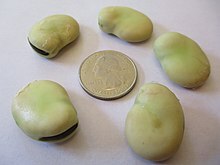 The term "fava bean" (from Italian: fava for the bean) is used in some English-speaking countries such as the US, but "broad bean" is the most common name in the UK and Australia and New Zealand. Raw mature fava beans are 11% water, 58% carbohydrates, 26% protein, and 2% fat. A 100 gram reference amount supplies 341 calories and numerous essential nutrients in high content (20% or more of the Daily Value, DV). Folate (106% DV) and dietary minerals, such as manganese, phosphorus, magnesium, and iron (range of DV 52 to 77%), have considerable content (table). B vitamins have moderate to rich content (19 to 48% DV). Broad bean plants are highly susceptible to early summer infestations of the black bean aphid, which can cover large sections of growing plants with infestations, typically starting at the tip of the plant. Severe infestations can significantly reduce yields, and can also cause discolouration of pods and reduction in their saleable values. Faba bean rust is a fungal pathogen commonly affecting broad bean plants at maturity, causing small orange dots with yellow halos on the leaves, which may merge to form an orange lawn on both leaf surfaces. Beans are also attacked by chocolate spot fungus, which can have a severe impact on yield. In mainland Europe and North Africa, the plant parasite Orobanche crenata (carnation-scented broomrape) can cause severe impacts on fields of broad beans, devastating their yields. Broad beans are generally eaten while still young and tender, enabling harvesting to begin as early as the middle of spring for plants started under glass or overwintered in a protected location, but even the main crop sown in early spring will be ready from mid to late summer. Horse beans, left to mature fully, are usually harvested in the late autumn, and are then eaten as a pulse. The immature pods are also cooked and eaten, and the young leaves of the plant can also be eaten, either raw or cooked as a pot herb (like spinach). Broad beans were a major food of old Mediterranean civilizations, particularly for the Romans and Greeks. Preparing broad beans involves first removing the beans from their pods, then steaming or boiling the beans, either whole or after parboiling them to loosen their exterior coating, which is then removed. The beans can be fried, causing the skin to split open, and then salted and/or spiced to produce a savory, crunchy snack. These are popular in China, Malaysia, Colombia, Peru (habas saladas), Guatemala (habas), Mexico (habas con chile), Gilan (North of Iran) and Thailand (where their name means "open-mouth nut"). In some Arab countries, the fava bean is used for a breakfast dish called ful medames. Fava beans are common in Latin American cuisines, as well. In central Mexico, mashed fava beans are a common filling for many corn flour-based antojito snacks such as tlacoyos. In Colombia, they are most often used whole in vegetable soups. Dried and salted fava beans are a popular snack in many Latin countries. Broad beans are widely cultivated in the Kech and Panjgur districts of Balochistan Province in Pakistan, and in the eastern province of Iran. They are called bakalaink in the Balochi language, and baghalee in Persian. In south Algerian cuisine, broad beans are used to make Besarah and Doubara. Doubara is popular in the city of Biskra. In the Sichuan cuisine of China, broad beans are combined with soybeans and chili peppers to produce a spicy fermented bean paste called doubanjiang. Perhaps due to the bean's popularity in Sichuan cuisine, in addition to the regular Chinese terms of "silkworm bean" (蚕豆 cándòu) or "orchid bean" (兰花豆 lánhuādòu), they are also known as "Sichuan beans" (川豆 chuāndòu) in Chinese. Fava beans (Colombia: Haba(s)) are a common food in most regions of Colombia, mostly in Bogota and Boyacá. Fava beans are used mostly in Dalmatia as a part of the traditional dish stuffed artichokes with fava beans and peas. Steamed fava beans (known as habitas) with cheese are common in the cold-weather regions of Ecuador, especially around the Andes mountains and surroundings of Ambato. Fava beans (Arabic: فول‎ fūl pronounced [fuːl]) are a common staple food in the Egyptian diet, eaten by rich and poor alike. Egyptians eat fava beans in various ways: they may be shelled and then dried, bought dried and then cooked by adding water in very low heat for several hours, etc. They are the primary ingredient in falafel. The most popular way of preparing them in Egypt is by taking the mashed, cooked beans and adding oil, salt and cumin to them. The dish, known as ful medames, is traditionally eaten with bread (generally at breakfast) and is considered the Egyptian national dish. Broad beans (Amharic: baqella) are one of the most popular legumes in Ethiopia. They are tightly coupled with every aspect of Ethiopian life. They are mainly used as an alternative to peas to prepare a flour called shiro, which is used to make shiro wot (a stew used widely in Ethiopian dishes). During the fasting period in the Ethiopian Orthodox Church tradition called Tsome Filliseta, Tsome arbeå, Tsome Tahsas, and Tsome Hawaria (which are in August, end of February–April, mid-November–beginning of January and June–July), two uncooked spicy vegetable dishes are made using broad beans. The first is Hilibet, a thin, white paste of broad bean flour mixed with pieces of onion, green pepper, garlic, and other spices based on personal taste. The second is siljo, a fermented, sour, spicy thin yellow paste of broad bean flour. Both are served with other stews and injera (a pancake-like bread) during lunch and dinner. Baqella nifro (boiled broad beans) are eaten as a snack during some holidays and during a time of mourning. This tradition goes well into religious holidays, too. On the Thursday before Good Friday, in the Ethiopian Orthodox Church tradition tselote hamus (the Prayer of Thursday), people eat a different kind of nifro called gulban. Gulban is made of peeled, half beans collected and well cooked with other grains such as wheat, peas and chickpeas. This is done to mourn the crucifixion of Jesus Christ. Boq'ullit (boiled salted broad beans embryo) is one of the most favorite snacks in the evening, the common story-telling time in north and central Ethiopia. It is particularly a favorite for the story-teller (usually a society elder), as it is delicious, and easy to chew and swallow. Ripe broad beans are eaten by passers-by. Besides that, they are one of the gift items from a countryside relative in a period close to the Ethiopian Epiphany. The Greek word fáva (φάβα) does not refer to broad beans, but to the yellow split pea and also to another legume, known as Lathyrus sativus. Broad beans are known instead as koukiá (Greek: κουκιά), and are eaten in a stew combined with artichokes, while they are still fresh in their pods. Dried broad beans are eaten boiled, sometimes combined with garlic sauce (skordalia). In Crete, fresh broad beans are shelled and eaten as a companion to tsikoudia, the local alcoholic drink. Favism is quite common in Greece because of malaria endemicity in previous centuries, and people afflicted by it do not eat broad beans. In India, fava beans are eaten in the Northeastern state of Manipur. They are locally known as hawai-amubi and are ingredients in the dish eromba. They are also eaten in the western Indian state of Maharashtra, where they are locally known as vaal and are mostly cooked in a form of curry eaten with roti or chapati. Broad beans, or "Baghalee" (Persian: باقالی) are primarily cultivated in the central and north parts of Iran. The city of Kashan has the highest production of broad beans with high quality in terms of the taste, cooking periods and color. However, broad beans have a very short season (roughly two weeks). The season is usually in the middle of spring. When people have access to fresh beans in season, they cook them in brine and then add vinegar and Heracleum persicum depending on taste. They also make an extra amount to dry to be used year-round. The dried beans can be cooked with rice, which forms one of the most famous dishes in north of Iran (Gilan) called baghalee polo (Persian: باقالی پلو) which means "rice with broad beans". In Iran broad beans are cooked, served with Golpar-origan and salt and sold on streets in the winter. This food is also available preserved in metal cans. Broad beans which are called Bagilla (باگله/باقله) in the Iraqi dialect of Arabic are a common ingredient in many Iraqi foods. One of the most popular Iraqi dishes that uses the broad bean is Bagilla Bil-Dihin (باگله بالدهن) also called Tishreeb Bagilla (تشريب باگله). This dish is a common breakfast dish in Iraq and consists of bread soaked in boiled broad beans’ water then topped with broad beans, melted Ghee, and often also a boiled or fried egg. Fool (فول) is another common breakfast dish in Iraq as well as many other Arab countries and consists of mashed fava beans. Another famous Iraqi dish is Timmen Bagilla (تمن باگله), which is Arabic for 'broad bean rice'. This classic Iraqi dish consists of rice cooked with broad bean and dill. In Rome, Italy, Fava beans are popular either cooked with guanciale or with globe artichokes, as side dish together with lamb or kid, or raw with Pecorino romano. Fave e Pecorino is the traditional dish for 1 May picnic in Tuscany, Umbria and Latium. In Sicily, Maccu is a Sicilian soup prepared with fava beans as a primary ingredient. In Apulia, broad bean purée with wild chicory is typical dish. Broad beans, called Soramame (Japanese:そら豆) lit: “Sky Bean”, are consumed in a variety of ways in Japan. Most commonly, the beans are boiled and are eaten straight or added to rice. 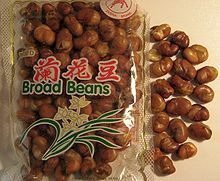 It is also consumed as a popular snack called “ikarimame” (Japanese:いかり豆) lit: “Anchor Bean”, where the beans are roasted or fried. Judd mat Gaardebounen, or smoked collar of pork with broad beans, is the national dish of Luxembourg. They are a primary ingredient of the Maltese Kusksu, a vegetable soup primarily containing fava beans and pasta beads. They are also used in a popular appetizer called bigilla where they are served as a pureé mixed with olive oil, lemon juice, garlic, parsley and mint. It is served with bread or crackers and is the Maltese answer to hummus. In Mexico, fava beans are often eaten in a soup called sopa de habas, meaning "fava soup". They are also eaten as a snack, in which they are fried, salted, and dried. They are either by themselves as a snack or in combination with other salted, dried beans and nuts. In Morocco, fava beans are made into bessara, a dip sold as a street food. In Nepal, fava beans are called bakulla. They are eaten as a green vegetable when the pods are young, generally stir-fried with garlic. When dried, fava beans are eaten roasted, or mixed with other legumes, such as moong beans, chick peas, and peas, and called qwati. The mixture, soaked and germinated, is cooked as soup and consumed with rice or beaten rice on the occasion of Janai Purnima also known as Rakshya Bandhan, a festival celebrated by the Hindus. The dry and stir-fried version of qwati is called biraula. The qwati soup is believed to reinvigorate the body affected by monsoon paddy season. In the Netherlands, they are traditionally eaten with fresh savory and some melted butter. The combination of the beans tossed with crispy fried bacon is also common. When rubbed, the velvet insides of the pods are a folk remedy against warts. Fava beans (Peru: Haba(s)) are eaten fresh or dried as stew, toasted, boiled, roasted, stewed, soup etc. Habas are one of the essential ingredients of the famous "Pachamanca" in the Andes of Peru, and are also an additive for "Panetela", which is a homemade remedy to keep your child fed and hydrated in cases of diarrhea or stomach infection and even for cholera treatment. To make Panetela combine and roast a cup of: fava bean (habas), barley, corn, wheat, rice and / or beans without allowing it to burn; add a cup of water, a carrot cut into pieces and a pinch of salt until fully cooked; drain, add water until it reaches a liter and boil one last time. For babies only the fluid is used. Fava beans (Portuguese: favas) is widely cultivated in Portugal and are very popular throughout the country. The most popular dish cooked with favas is "favada", a stew with onion and pork - depending on the region of the country the pork may be chorizo, bacon, pork shoulder, ribs or the mixture of many of these. In Alentejo a lot of coriander will be added in the end. Besides favada, fava beans may be served dry and fried as an apetiser. Broad beans (Spanish: habas) are widely cultivated in Spain. Culinary uses vary among regions, but they can be used as the main pulse in a stew (habas estofadas, michirones) or as an addition to other dishes (menestra, paella). In certain regions they can be eaten while unripe or fried and packaged as a snack. Fava beans are one of the most widely consumed foods in Sudan. For most Sudanese they form the main dish during lunch time (ghada), especially more so for city and urban dwellers. The beans are cooked by steadily boiling over a sustained period of time. Similar to Egypt, the cooked beans are mashed, and prepared by adding salt and pepper. For additional flavour, sesame oil is added along with a sprinkling of jibna ("feta" cheese) on top. The dish is then eaten with bread and is sometimes refereed to as ful medames. Broad beans (Swedish: bondbönor, literally: peasant beans), which in Sweden were traditionally eaten as soaked brown and boiled dried broad beans fried in lard, were for a very long time popular to add to other foods as a filling side, specially with fried pork. The green raw and lightly boiled broad beans were only used seasonally as a side green. It almost disappeared from Swedish plates in the 70's during a time of rapid increase in expectations of food quality and variety, and changes in food habits. However, since the 2000's, broad beans have made a comeback, partly as healthy, locally grown produce, but even more because of an increased interest in legumes, vegetarianism, healthy foods, but also a general greater curiosity about food in general, including a renewed interest in forgotten traditional foods of Sweden, as well as the increased popularity of foreign food, specially Middle-Eastern food, among Swedes, but even more among immigrants from North Africa and the Middle-East specially in the Egyptian/Sudanese dish Ful Medames (فول مدمس; fūl mudammas, fūl midammis or ful medames), or as an ingredient in Egyptian and Gaza style falafel, which often contains broad beans instead of chickpeas, or both, which has lately become one of the most popular fast foods in Sweden. In Syria, broad beans are prepared in multiple ways for breakfast, lunch or dinner. Ful Medames is the same as the Egyptian dish (it is not mashed though) but with the addition of tomato, parsley and onion and with olive oil. Another version of it includes the addition of tahini (sesame paste), olive oil, garlic and lemon. For lunch, broad beans are cooked with a mix of minced and big chunks of meat and is topped on white rice and eaten with cold yogurt and cucumber salad. Bulgur is sometimes used in preparing this recipe instead of rice. Broad beans are cooked with pieces of garlic, meat and meat stock with the addition of lemon juice and cilantro. This dish is called foulieh and is eaten on the side with rice. Same recipe is prepared without meat as a vegan dish eaten on lent by Christians in Syria. In Turkey, broad beans are called bakla. This is also the name of a zeytinyağlı dish made by simmering young and tender broad bean pods with chopped onions in olive oil. It is traditionally garnished with dill and served cool, together with yoghurt. Another popular dish is fava, a meze prepared by soaking and boiling shelled dried broad beans until soft and then pureeing with olive oil and optionally fresh dill. The puree is left to set overnight, and served cold, garnished with dill and slices of lemon. Sufferers of favism must avoid broad beans, since these trigger a hemolytic crisis. Broad beans are rich in tyramine, and thus should be avoided by those taking monoamine oxidase inhibitors. On the road stands a small temple called that of Cyamites. I cannot state for certain whether he was the first to sow beans, or whether they gave this name to a Hero because they may not attribute to Demeter the discovery of beans. Whoever has been initiated at Eleusis or has read what are called the Orphica knows what I mean. Kyamites was probably a name for Hadês. In Sicily, where Saint Joseph is regarded by many as their Patron saint, and in many Italian-American communities, thanks are given to Saint Joseph (San Giuseppe in Italian) for preventing a famine in Sicily during the Middle Ages. According to legend, there was a severe drought at the time, and the people prayed for their patron saint to bring them rain. They promised that if God answered their prayers through Joseph's intercession, they would prepare a large feast to honor him. The rain did come, and the people of Sicily prepared a large banquet for their patron saint. The fava bean was the crop which saved the population from starvation and is a traditional part of Saint Joseph's Day altars and traditions. Giving food to the needy is a Saint Joseph's Day custom. In some communities it is traditional to wear red clothing and eat a Neapolitan pastry known as a zeppola (created in 1840 by Don Pasquale Pinatauro in Napoli) on Saint Joseph's Day. Maccu di San Giuseppe is a traditional Sicilian dish that consists of various ingredients and maccu that is prepared on this day. Maccu is a foodstuff and soup that dates to ancient times which is prepared with fava beans as a primary ingredient. Upon a typical Saint Joseph's Day altar, people place flowers, limes, candles, wine, fava beans, specially prepared cakes, breads, and cookies (as well as other meatless dishes), and zeppole. Foods are traditionally served containing bread crumbs to represent saw dust since Joseph was a carpenter. Because the feast occurs during Lent, traditionally no meat was allowed on the celebration table. The altar usually has three tiers, to represent the Trinity. Popular customs among Christians of various liturgical traditions observing Saint Joseph's Day are attending Mass or the Divine Service, wearing red-coloured clothing, carrying dried fava beans that have been blessed, and assembling home altars dedicated to Saint Joseph. In ancient Greece and Rome, beans were used in voting; a white bean was used to cast a yes vote, and a black bean for no. Even today, the word koukia (κουκιά) is used unofficially, referring to the votes. Beans were used as a food for the dead, such as during the annual Lemuria festival. The ancient Roman family name Fabia and the modern political term Fabian derive from this particular bean. The Pythagoreans were forbidden from ever eating, mentioning, or looking at beans. In Ubykh culture, throwing beans on the ground and interpreting the pattern in which they fall was a common method of divination (favomancy), and the word for "bean-thrower" in that language has become a generic term for seers and soothsayers in general. The colloquial expression 'not worth a hill of beans' alludes to their widespread economy and association with the peasant diet. In Italy, broad beans are traditionally sown on November 2, All Souls Day. Small cakes made in the shape of broad beans (though not out of them) are known as fave dei morti or "beans of the dead". According to tradition, Sicily once experienced a failure of all crops other than the beans; the beans kept the population from starvation, and thanks were given to Saint Joseph. Broad beans subsequently became traditional on Saint Joseph's Day altars in many Italian communities. Some people carry a broad bean for good luck; some believe that if one carries a broad bean, one will never be without the essentials of life. In Rome, on the first of May, Roman families traditionally eat fresh fava beans with Pecorino Romano cheese during a daily excursion in the Campagna. In northern Italy, on the contrary, fava beans are traditionally fed to animals and some people, especially the elderly, might frown on human consumption. But in Liguria, a maritime region near northern Italy, fava beans are loved raw, and consumed fresh in early spring as the first product of the garden, alone or with fresh Pecorino Sardo or with local salami from Sant'Olcese. In some Central Italian regions, a once-popular and recently rediscovered fancy food is the bagiana, a soup of fresh or dried fava beans seasoned with onions and beet leaves stir-fried, before being added to the soup, in olive oil and lard (or bacon or cured ham fat). In Portugal and Spain a Christmas cake called bolo Rei in Portuguese and roscón de reyes in Spanish (King's cake) is baked with a fava bean inside. Whoever eats the slice containing it, is supposed to buy next year's cake. A similar tradition exists in France, where the fève (originally a dried bean, but often now a small china or metal trinket) is placed in the galette des rois; the person who finds it in their slice becomes the king or queen of the meal, and is often expected to serve the other guests to drink. Pliny claimed they acted as a laxative. European folklore also claims that planting beans on Good Friday or during the night brings good luck. Frederick E Rose (London) Ltd v William H Pim Junior & Co Ltd  2 QB 450, is an English contract law case where the two litigants had both mistaken feveroles for ordinary horse beans. Can be used as a green manure, due to nitrogen fixation it produces. In the Netherlands, roasted or fried broad beans are regarded as a local delicacy of the city of Groningen, and is locally called molleboon. Until the 1800s, the city council used mollebonen for the voting process, sometimes real beans, sometimes made of stone or clay. The word Molleboon became a nickname for the inhabitants of the city. ^ "The Plant List: Vicia faba var. equina Pers". Royal Botanic Gardens, Kew and Missouri Botanic Garden. 2013. Retrieved 24 April 2018. ^ "Core Historical Literature of Agriculture". Chla.library.cornell.edu. Retrieved 2013-04-30. ^ "Daughter of the Soil". Daughter of the Soil. Retrieved 2013-04-30. ^ Helstosky, Carol (2009). Food Culture in the Mediterranean. Greenwood Publishing Group. p. 7. ISBN 0313346267. ^ Collar "Recipes from Luxembourg" Archived 2006-02-09 at the Wayback Machine, Luxembourg Tourist Office, London. Retrieved 3 December 2011. ^ "Morocco's best street food". cnn.com. ^ Jennifer E. Frank (October 2005). "Diagnosis and management of G6PD deficiency". American Family Physician. 72 (7): 1277–82. PMID 16225031. ^ Daniel K. Hall-Flavin, M.D. "MAOIs and diet: Is it necessary to restrict tyramine?". Mayo Clinic. ^ "Pausanias Description of Greece 1.37.4". Tufts University, Perseus Digital Library Project. ^ "Eleusis: Archetypal Image of Mother and Daughter". Karl Kerényi, Princeton University Publishing. ^ a b Clarkson, Janet (2013). Food History Almanac. Rowman & Littlefield. p. 262. ISBN 144222715X. ^ "Louisiana Project - St. Joseph's Day Altars". houstonculture.org. ^ Jankowski, Nicole (18 March 2017). "Move Over, St. Patrick: St. Joseph's Feast Is When Italians Parade : The Salt : NPR". NPR. Retrieved 20 March 2017. ^ Kahn 2001, p. 5. ^ Cornelli & McKirahan 2013, p. 160. Wikimedia Commons has media related to Vicia faba.